Punditji went to London with Sri Satguru Ji. The London-based Namdhari Sikhs had also earlier called upon the Satguru at Sri Bhaini Sahib via phone and requested "Patshah Ji, give us Your Darshan in England and bless its people." Acknowledging the request, Patshah Ji went to London. He was bound to go there anyway because the people of that land were praying at His Feet. The first Guru of Kalyuga, Guru Nanak Dev Ji, also did the same when Vali Kandhari did not share the water he had with the people. So Guru Nanak Dev Ji Himself went to the foot of the hill upon which Vali Kandhari lived. Quenching the thirst of Mardana was just an excuse. Who knows how many peoples' thirsts He quenched then? Hence the Guru went there to quench the thirst of the suffering people. Similarly, hearing the prayers of the people of England, Gareeb Nivaj (Supporter of the poor), the Heir of Guru Nanak Dev Ji's Throne, Sri Satguru Jagjit Singh Ji set out on a crusade to England. There many highly acclaimed saints had prayed and held Divans at the `Mangat Hall' in the hope of bringing rain. But nothing happened. The officials there had immediately put the Photo of Satguru Ji on television and announced that the Guru of Namdharis was arriving from India, and that He would bring the rain. Those people (who did the announcement) thought that like the rest of the `Saints' and `Sages', HE (Satguruji) would also leave after being unsuccessful. 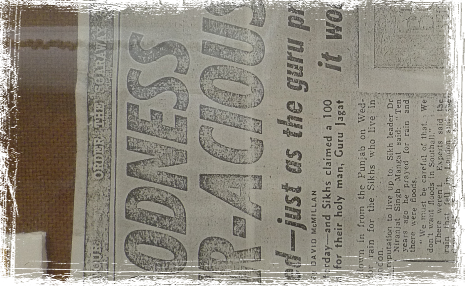 The Namdharis who call Him `Guru' will be all disgraced. But what do those poor people know of the Avatar of Akal Who has come to remove sorrow and suffering of the living-beings? Sri Satguru Jagjit Singh Ji gave Darshan at the `Mangat Hall'. A Divan was held. At the end of the Divan, some people, including Britons, approached the Satguru and requested "O, Supporter of the poor, whatever it takes, please bless us with rain." At first Patshah Ji said "Mein Kaun Ha Meeh Puaun Vala?" ["Who Am I To Make Rain Fall?"] Because Patshah Ji never admits Who He really is. After being requested the second time, the Satguru said "Acha, Savayray Ardas Karangay Sri Satguru Ram Singh Ji Day Charna Vich | Sachay Patshah Ji Kirpa Karangay Ta Meeh Pae Javayga |" [Alright, In The Morning (We) Will Do Ardas At The Feet Of Sri Satguru Ram Singh Ji. If Sachay Patshah Ji Wishes Rain Will Fall." Morning came, Asa Ji Di Vaar's Bhog (Conclusion) was done. Pundit Gopal Singh Ji was given the Hukam (Order) to perform Ardas. Punditji did the Ardas "O, Akal Purakh! Sri Satguru Sachay Patshah Jio, At Your Feet It Is Requested That The Rain May Fall. Do Shower Your Blessings. Forgive The Beings Of Their Sins And Be Kind To Them. Men And Animals, Trees And Plants, All Are Suffering Without Water." Guru of Namdharis, Sri Satguru Jagjit Singh Ji, Who traveled from India was responsible for the rain. Where ever the Britons see Namdharis walking by, they'd say "They are the ones who brought rain." Great indeed is Sri Satguru Jagjit Singh Ji Maharaj. It rained so much that there was no ending! For over twenty days the rain poured down. Gareeb Nivaaj Ji was approached the second time because it had rained so much in England that flooding had started to become a problem. From there, Patshah Ji went to Africa. 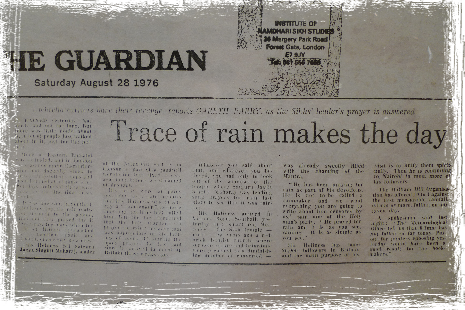 Some journalists there approached Him and asked "We have heard that You had brought rain to England." "Mein Kaun Ha Meeh Puaun Vala?" ["Who Am I To Make Rain Fall?"] Came as a reply from Patshah Ji in such a humble way. There was absolutely no sign of pride in His Words. Even after showering such great blessings, He did not want to make Himself known. It is indeed the way of Akal Purakh how Satguru Ji answered (the people's) prayers and with His Will the rain also stopped. Inder Devta, Agni Devta, Paun Devta, all are at His commands. Dhan Dhan Sri Satguru Jagjit Singh Ji Maharaj! This extract was taken from the book "Alaukik Kautak" (October 2003 Issue) published by S. Harishchandra Arora.